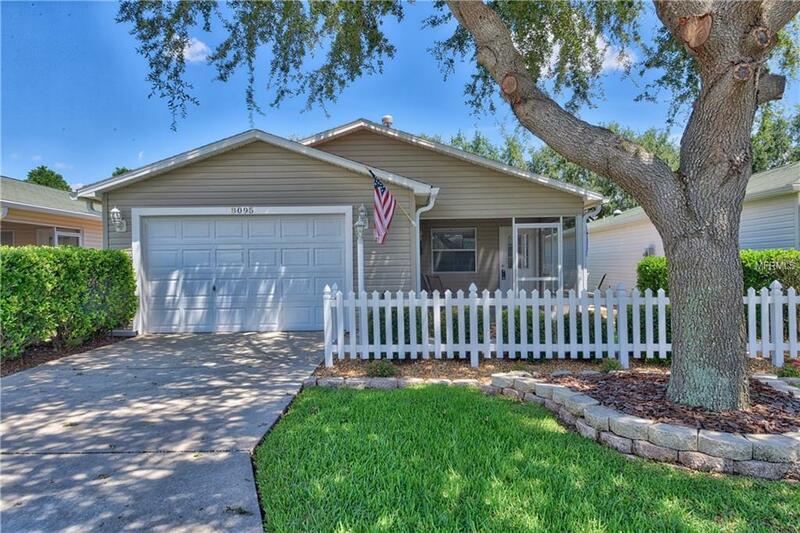 The Village of Calumet Grove, Colony Patio Villa, so close and convenient to Mulberry Grove Regional Rec Center, the VA, Nancy Lopez Country Club & Golf, and the new shopping on CR 42 (Publix, Codys, Beef O Brady's, etc.). Plus with no homes behind you are just 3 houses from the golf cart path access. The exterior has new lamp post light and garage coach lights, gutters & downspouts, new mulch and plants, stepping pavers to the patio, rock mulch in the side-yard beds and new roof ridge vent. You enter the home through a screened lanai with porcelain tile and perfect for relaxing. The 18x18 porcelain tile continues all through the house, blending perfectly with the new 3" baseboards. There is no carpet. The family room is spacious with a beautiful ceiling fan and light. The dining room leads to a side patio and window access to the screened lanai. There is custom painted walls through-out home that matches the oak cabinets and complements the newly installed Level 3 granite kitchen counter-top and breakfast bar. The updated kitchen has a new stainless steel dual sink, faucet/sprayer and garbage disposal. There is a kitchen pantry and a sitting area. The owners suite has a large walk-in closet, all in one shower, new mirrored cabinet and linen closet. The guest area has a spacious closet and a tub/shower combo. There is highly desired natural gas appliances. These include the furnace, water heater and range. A washer/dryer is also included with the home. You need to see this one!